Augmented reality is not just for catching Pokemon anymore. Porsche is bringing augmented reality to Porsche techs in order to improve service times. The new technology is called "Tech Live Look," and uses a set of illuminated VR glasses. The glasses capture what the tech is seeing, and send images in real-time to a staffed central Porsche technical center. Porsche estimates that the glasses are will reduce service resolution times by up to 40%, and help to improve the quality of service at Porsche dealerships. How Will Augmented Reality Aid Porsche Techs? Developed by Atheer Inc., the new technology uses the AiR Enterprise™ software platform to run a pair of lightweight smart glasses. The smart glasses feature projection technology, as well as a high-resolution, auto-focus camera to show fine detail. The glasses also include a powerful LED light to assist visibility in dark spaces in the engine compartment or under the car. Images captured by the camera can be sent to a Porsche technical support center in real-time. The initial pilot program ran this past July at eight Porsche dealers in the US and one in Canada, and allowed the dealers to communicate seamlessly with the Porsche technical center in Atlanta, Georgia. 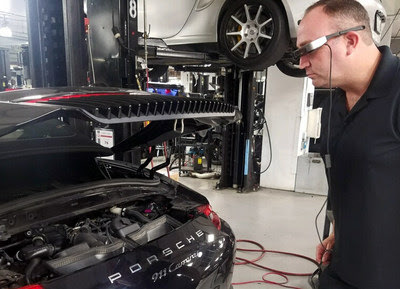 Why Smart Glasses for Porsche Techs? On the surface, it seems that glasses are a slightly odd solution to a problem that could have been solved with a hand-held camera. Indeed, in some cases a handheld camera may actually work better. It would certainly be simpler to get a handheld camera into spaces smaller than a tech's head. The glasses have a secondary benefit not shared by a handheld camera. Once the tech center helps to identify the issue, relevant technical bulletins and service instructions can be projected directly in the glasses. This keeps the tech's hands free to work. The new technology is expected to launch at Porsche dealerships in 2018.